Snowflake eels are native to the Indo-Pacific Ocean all the way to Hawaii, as well as Baja California and Mexico. In the wild, they can grow as large as 40” (102cm). They tend to reside in rocky crevices and reefs, where they wait to ambush fish and other small sea creatures. It is one of around 120 species of marine eels. They tend to prefer more brackish water in the wild and are more peaceable than other eel types. They become most aggressive when feeding. Eels grow from about 8″ (21cm) to their full length in six months, which is no issue in the wild but can be a concern for owners adding one to their tank. Considered among the most beautiful eels, the Snowflake Eel is a fairly hardy, easy to care for addition to your saltwater tank. They are named for the snowflake shaped design that runs across their bodies in black and white. They also tend to have faces that appear to be “smiling” and eyes that are rimmed in gold, giving them a visually stunning appearance. Their beauty and relative ease of care make them a common recommendation for a first eel. What fish can live with a snowflake eel? Snowflake eels are considered safe for the reef, but there are certainly other fish it cannot live with. The snowflake eel can be a more aggressive breed – if a fellow aquarium dweller is small enough for the snowflake eel to swallow, the eel probably will. However, it will get along with most types of fish, provided it cannot swallow them instead. They are safe for housing with many invertebrates (corals, anemones, etc. ), but crustaceans are not safe. Snowflake eels are also generally safe living with other eels, including other snowflake eels. The only exception is when a new, smaller eel or other fish is introduced. 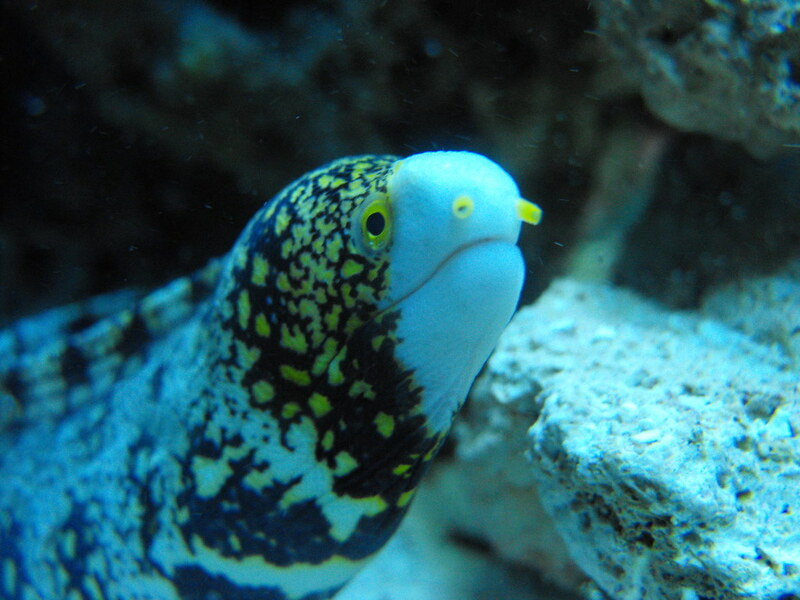 The snowflake eel may become aggressive toward the newcomer, and sometimes this results in the snowflake eel eating (or attempting to eat) the new eel or fish. Thankfully, most snowflake eels very quickly acclimate to a new tank (usually within a few hours), which allows them to accept changes to their tank life a bit more readily. You may be asking will a snowflake eel eat my fish? Again, the guiding principle when choosing which fish to have in your aquarium with your snowflake eel is never to choose a fish, invertebrate or crustacean that is smaller than the snowflake eel’s mouth. 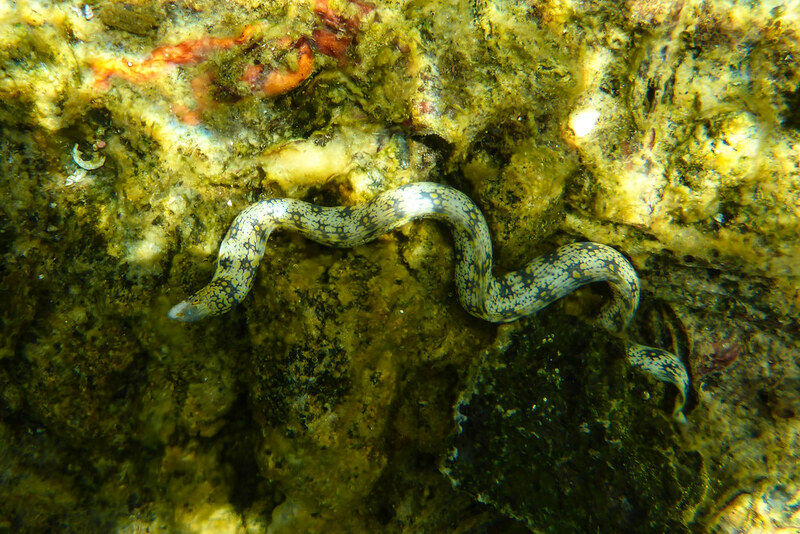 Note that this type of eel is also likely to try to bite its handler if it is hand-fed, although they can be trained to hand-feed. Exercise caution if you choose to pursue this route as snowflake eel bites can be very painful and easily infected. Most marine enthusiasts recommend never trying to hand-feed a snowflake eel. Snowflake eels have an excellent sense of smell and terrible eyesight, so they are likely to bite in the general direction of food rather than waiting to figure out if what they are about to eat is dinner versus your hand. They also have very quick striking speeds, meaning they can go from completely still to on top of their prey in a matter of moments. Snowflake eels also have a habit of trying to escape their tanks, so keeping them in a tank that closes tightly is also a must. Snowflake eels are decidedly carnivorous and will eat krill, shrimp, fish, clam, squid, and other meats that have been frozen or freeze-dried. In the wild, the snowflake eel attacks crustaceans and other fish, which it will attempt in the tank if other types of fish are small enough to be viable prey. This issue does extend to cleaner shrimp and crustaceans as well (unless, of course, you intend for the crustaceans to be eaten). Snowflake eels are more likely than other eel varieties to accept non-living food options. A variety of seafood-based products makes for an ideal diet, and using feeding tongs or a skewer rather than your hands is generally safer. However, as your snowflake eel will approach the food with the same force regardless of whether you use your hand or some device, be careful not to use anything sharp that may injure your eel on impact. You should feed your snowflake eel two to three times per week. If your eel appears to be consistently missing their food (i.e., swimming toward the skewer but swimming right past it), consider using bigger pieces of food. Remember, your eel cannot see well, so making their food harder to miss will make feeding time easier for both of you. Interestingly, snowflake eels have a double jaw (Pharyngeal Jaw) – their visible teeth grab their prey, but another set of teeth (essentially a separate jaw) comes forward and pulls the prey into their mouths. Eels do occasionally hibernate and will hide not eat for several weeks during this time. Overall, this eel is very hardy and is said to have little in between complete health and fatal sickness. Snowflake eels tend to grow based on the size of their tank, so while the minimum tank size is 50 gallons (190L), do know that the larger your tank is, the more likely it is that your eel will grow larger (some report eels over 40 inches). An average specimen in an average tank (50-60 gallons) will stay between 24-36” (61-91cm). Snowflake eels need plenty of rocks and places to hide. Attempt to mimic the rocky crevices they are used to inhabiting in the wild. Having a variety of hiding places and rocky areas is of particular importance if you have more than one of the eels in your tank. Also, ensure that any rocks that may be stacked on top of each other are tightly secured. Your snowflake eel is very strong, and will likely try to wriggle between the rocks. Make sure it isn’t going to knock the rocks over on accident. 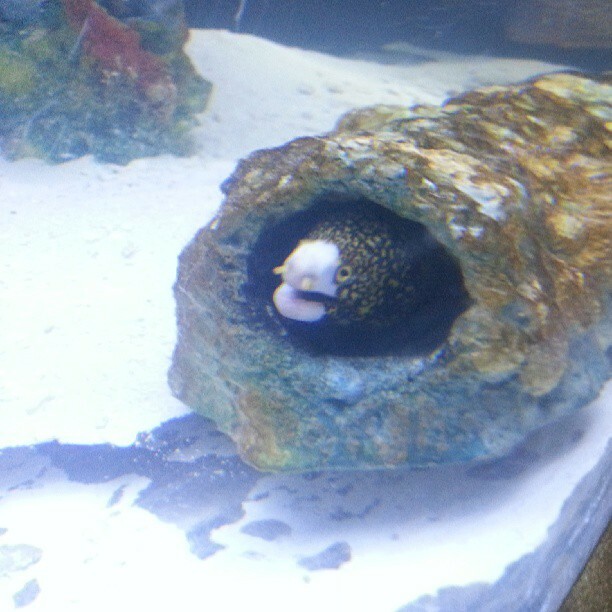 The snowflake eel is an accomplished escape artist as well, finding a way to get out of any opening that is even close to big enough for it to fit. Thus, it is important that your tank lid is secure, as well as any openings on top of it (such as ones for feeding). If your eel does escape – and it probably will never stop trying to do so – pick it back up with a damp paper towel. Rinse off your eel and return it to the aquarium. Even if you come upon your eel out of its tank and it appears to be dead or dried out, still try rinsing and replacing in the aquarium. As stated earlier, this eel is exceptionally hardy, and may very well recover from its escape just fine. Be sure that your filtration and aeration system is powerful enough for your tank. Since many of the smaller tank cleaning species cannot live with the snowflake eel, you will need to make sure you either have fish that can keep up with the cleaning or that you pay attention to the cleanliness of the tank a bit more carefully. Protein skimming is especially important when keeping snowflake eels. As far as salinity, having near sea water conditions (NSW conditions) is important, although keeping specific gravity slightly under 1.025 can be helpful. Most owners find it next to impossible to breed their snowflake eels. The differences between the genders are negligible, and it requires a large tank to keep more than one eel anyway. That said, snowflake eels are protogynous, meaning that whichever eel is dominant will change from female to male. This gender change can take months at best and a year or so at most, which also discourages potential breeders. If you do have a pair of eels and are hoping they will breed, note that they do rarely reproduce in captivity and that currently no known methods of improving breeding exist. Your best option is to keep both eels well-fed and ensure that they have enough space to live together peaceably even if they do not breed.